Creator Direct: Event Horizon wins UK Award! I while back, I contributed an 8 page story to Event Horizon, a sci-fi/horror anthology put together by Mam-Tor Publishing and Liam Sharp. Liam emailed me this week to let me know that the book won a Sci-Fi Award from the International Festival of Science Fiction and Fantastic Film 2006. The story I contributed to was called Vanishing Herd and was written by Dan Wickline. Apparently, Mam-Tor will be re-releasing the book in PDF format at a discounted price. For those that enjoy reading web comics or reading digital versions of printed comics, this should be a great opportunity to grab a copy of the book. I suppose you could also print your own copy from the PDF if you'd like. 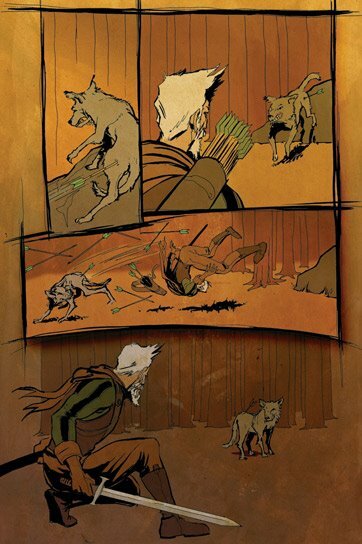 During the production of the original comic, we went through several revisions on the art. The final version of the art I did had some details thrown in, a few tweaks, and a whole lot more blood. That last version never made it into the final comic. The previous version (without the edits) was printed in the book. It still looked great, and there aren't really any problems with the art, we just added to it for the final version. So if anyone owns the printed version of the book, you may still want to check out the re-release since it does contain the final art I contributed to the book. I'll post a little more information about downloading as soon as I get it.